"More unusual family fun can be had at Vung Tau's Lam Son Stadium, which hosts greyhound racing every Friday and Saturday night starting at 7pm. It's one of the few places in Vietnam where Vietnamese people can legally gamble. The minimum bet is VND10,000, so having a flutter won't break the bank, and it's easy to place bets because the program is printed in English, as well as Vietnamese and Chinese." Vung Tau - is a resort town about 125 km from Ho Chi Minh City. The whole town is on a peninsula separated from the mainland by a river: the Co May river. The city is located at a long stretch of about 14 km long and 6 km wide. Where the most southern tip of the city touches the ocean, there are two famous mountain Nui Lon and Nui Nho ie Big Mountain and Little Mountain. 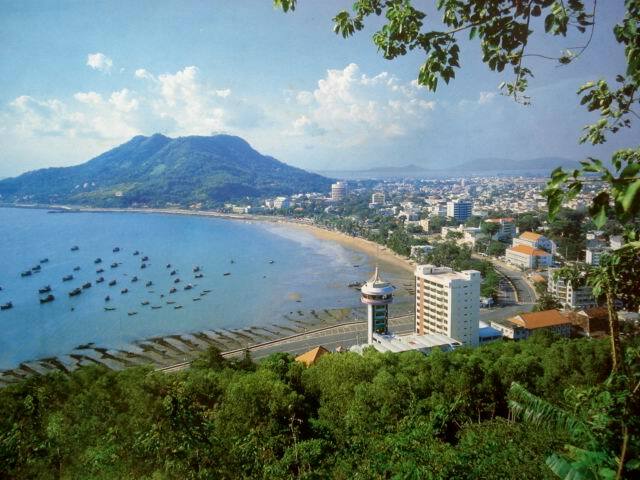 During the French colonial era Vung Tau was known as Cap Saint Jacques. The first, who did mention Cap Saint Jacques, were Portuguese sailors who wanted to honour of their holy patron. 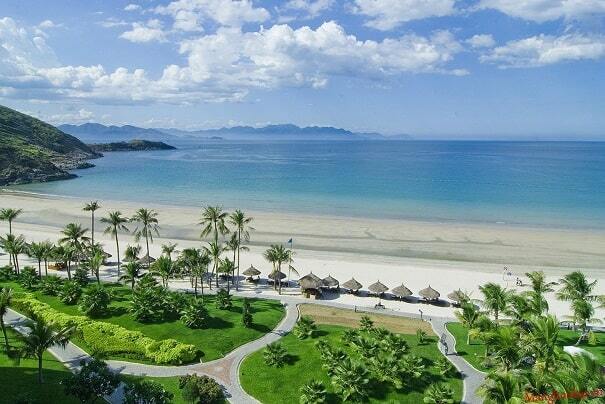 Vung Tau is primarily a resort for the wealthy. They like to go for a day out of town (Ho Chi inh City) and there is indeed much to do in this town. Options include, swimming, snorkelling, watching greyhound racing and enjoy the golf course. 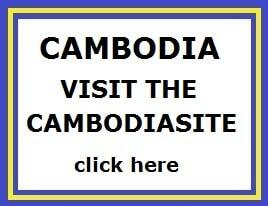 Yet Vung Tau has a large number of cheap guesthouses and hotels. Some of the rooms have fans and shared bathrooms and other ones have air-conditioned rooms and various facilities. It has always been an important port, especially during the period of French rule. Today, the importance of port has declined sharply, but it still plays a significant role in the offshore oil industry. Vung Tau is the only oil port of Vietnam, where crude oil and gas dominate the economy of the city. 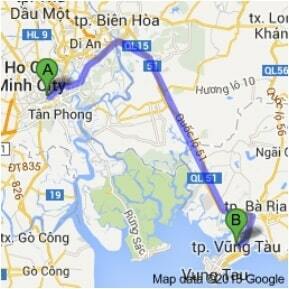 The center of Vung Tau is quite small in size, so do not hesitate to walk here. Some nice places for a walk: Bacu street (centre of town), DJO Chieu street (restaurants), Trung Trac and Trung Nhi square, Cong vien Bai Truoc (park at the beach) and the sidewalks along the shoreline. The only drawback is that foreigners are constantly harassed by motorcyclists, especially if you are alone. On top of Little Mountain there is a giant Jesys statue with his arms outstretched to embrace the South China Sea. 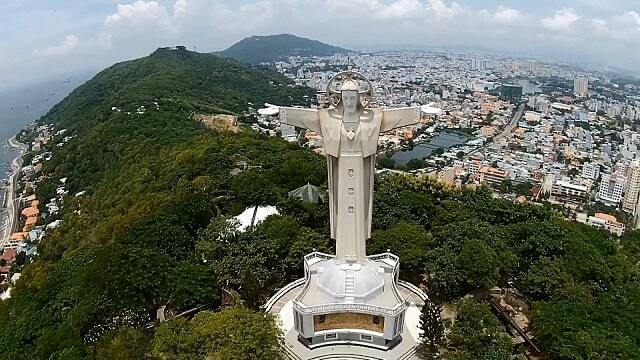 This 32m Giant Jesus statue is one of the largest in the world - larger than his illustrious Brazilian cousin. It is possible to climb into the arms for a panoramic view of Vung Tau. The Vung Tau Market, the new central market, was built in 1985. The purchase of a Vietnamese meal starts at the market. The products that you buy at the market are cheaper and fresher than in the shops. That's why a market is very familiar to every Vietnamese, especially for housewives. What can you do in Vung Tau? On top of the Little Berg (Noi Nho) is a big Jesus statue. With his arms outstretched, he seems to embrace the South China Sea. This 32m high statue of Jesus is one of the largest in the world. He is bigger than his illustrious Brazilian cousin. It is possible to climb up into the arms for a panoramic view of Vung Tau. The lighthouse was built in 1910 by the French. It also offers a spectacular view of Vung Tau. Although the image of Jesus and the lighthouse tempting close together, it is not possible to directly from the one to the other, because there is a military base between them. Beyond Mulberry Beach winds a beautiful road through the hills to some old French cannons. There are six of these huge cannons. They show how strategically important Cap St Jacques was in the old colonial period. The canons guarded the waterway to Saigon. At the weekend the French governor Paul Doumer (later the French President) lived in the White Villa. This beautiful, large colonial residence has extensive gardens and a strange empty interior. The white residence is located approximately 30 meters above the road on a winding lane. Front Beach This is halfway between Big Mountain and Little Nountain. Restaurants, kiosks and hotels are close to the beach. Front Beach is connected through with the town by a small park called Front Beach Park. Since this beach is located near the tourist center of the city, most people will come here to visit the park and watch the sunset. Back Beach is actually the only beach, which is suitable for the tourists. It is three kilometers long and stretches from the Little Mountain to the Paradise Park. Pineapple Beach is a small beach along Halong street, close to the Little Mountain. Mulberry Beach is a small beach west of the Great Mountain.